New book, 55 pages. The conduct of a successful air campaign requires a combination of strategy, tactics, capable aircraft, well trained pilots - and good leadership. During WW2, the RAF, Commonwealth (RCAF, RAAF, RNZAF and SAAF) and 'Free European' forces employed almost 250 fighter squadrons throughout the World, from the Aleutians to the South Pacific, throughout Europe, the Middle East and North Africa, India, Burma and the East Indies and East Africa. The RAF's basic tactical formation was the squadron, and this was the first step of independent commanders usually held by a Squadron Leader. The period in command could vary from a matter of days to over a year and so many hundreds of men were appointed as Officers Commanding (OC) of a squadron. As tactics developed and larger formations were used in action, several squadrons would operate in concert and were grouped together as a Wing, led by a Wing Leader. usually of Wing Commander rank. By the mid war years as these Wings became independent mobile formations, the command was given to a Group Captain with leadership in the air held by the Wing Leader, more formally titled as Wing Commander Flying (WingCo). Most were highly decorated, and some were very successful aces but all were highly experienced with a proven record of leadership and ability. The aim of this series is to introduce these men so far as available information allows by giving short biography and describing the operational units that they led during the war. 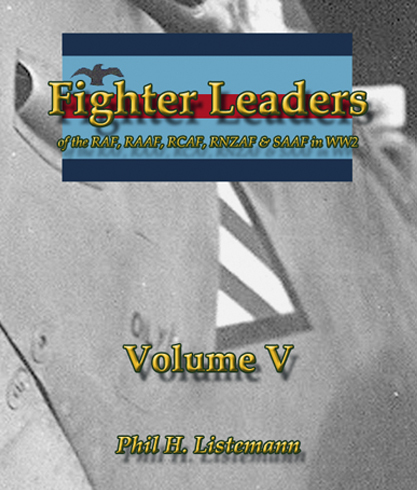 This volume contains the biography of 52 pilots: D.G. Andrews (Aus), R.E. Bary (NZ), F.V. Beamish (Ire), M.L.F. Beytagh (UK), M.V. Blake (NZ), E.P.W. Bocock (UK), A.D.McN. Boyd (UK), R.E.P. Brooker (UK), J.D. Browne (USA), L.V. Chadburn (Can), J.M. Checketts (NZ), W.H. Christie (Nor), M.V.M. Clube,(UK), P.Y. Davout (Can), A.H. Donaldson (UK), E.M. Donaldson (UK), J.M. Donaldson (UK), L.M. Gaunce (Can), L.M.E. Geerts (Bel), A.V. Gowers (UK), R.E. Green (UK), N.D. Harrison (NZ), B. Howard (Aus), F.J. Howell (UK), H. Hrbacek (Cz), S. Janus (Pol), I.F. Kennedy (Can), J.H. Lacey (UK), F.W. Lister (UK), J.L.H.E. Marchelidon (Fr), R. Marples (UK), P.E. Meagher (Ire), I.C. Ormston (Can), M.S. Osler (SA), J.R.A. Peel (UK), W.H. Pentland (Can), H.M. Pinfold (UK), A.F. Roscoe (USA), W.A.J. Satchell (UK), R.E.G. Sheward (UK), G.L. Sinclair (UK), T. Smart (UK), L.T. Spence (Aus), B.G. Stapleton (SA), J.E. Storrar (UK), S vB. Theron (SA), P.V.K. Tripe (Can), P. StG. B. Turnbull (Aus), M.T. Vanderpump (NZ), C.A. van Vliet (SA), J.L. Waddy (Aus), S.L. Welshman (Aus), totaling 22 DSOs, 52 DFCs and 3 DFMs.